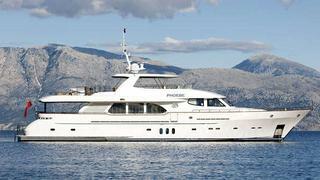 A call to Camper & Nicholsons brings news that Jeremy Comport has signed the 30.15m motor yacht Phoebe for sale. Custom built by Dutch yard Moonen to a design by Rene Van der Velden and launched in 2009, Phoebe has had the same owner since new. A light-filled interior is decorated in European walnut wood, leathers and fine fabrics, and she accommodates eight guests in four staterooms. She also has accommodations for three crew members. The master stateroom is full beam and fitted with oversized portholes for more daylight to come in, and there is also a VIP stateroom and two twin cabins. All staterooms have fully-fitted marble en suite bathrooms. Twin 1,800hp engines give her a cruising speed of 19 knots and, with a range of 2,500 nautical miles at 11 knots, she is ideal for long distance cruising and is fitted with zero speed stabilisers. Phoebe is asking €6.25 million.